The news from Elon Musk late last week was that Tesla/Solar City will offer solar glass roofs. But his subtext was even more interesting. Beauty – and utility partnerships – will drive a microgrid future. Musk is taking heat for not providing enough engineering or pricing details during Friday’s announcement. True. But what Musk did do, in his characteristic big vision way, was show that he thinks he’s figured out an aspect of green energy marketing that eludes many: How to make kilowatts into eye candy for the masses. In his presentation, he made secondary the oft-repeated industry selling points of reliability, sustainability and economics. Musk instead focused on the human eye. “The goal is to have solar roofs that look better than a normal roof, generate electricity, last longer, have better insulation and actually have an installed cost that is less than a normal roof plus the cost of electricity,” he said. The setting for the announcement was telling: Universal Studios, the former set of Desperate Housewives. Tesla had retrofitted Wisteria Lane’s houses with solar glass rooftops. An already pretty neighborhood known by millions of Americans became prettier. On display were four upscale homes with new and attractive solar glass roofs: a traditional colonial with textured-looking tiles; a French-slate style roof created with hydrographic printing; a contemporary home roof; and a Tuscan-style roof that mimicked terra cotta. “It’s a neighborhood where the aesthetics actually get better. The key is to make solar something desirable,” he said. But there is the obvious question – doesn’t glass break? Again, Musk went to visuals for the answer. 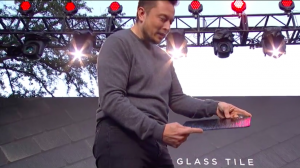 He showed a weight being dropped on three kinds of conventional roof tiles and Tesla’s solar glass tile. The conventional tiles smashed; the glass tiles did not. Musk is going after the new roof market. About 4 to 5 million U.S. homeowners replace their roofs annually, and about 20 times that number worldwide, he said. The houses used Tesla’s new Powerwall 2 battery, which offers twice as much energy as Powerwall 1 or 14 kWh /7 kW. That’s enough to power the refrigerator, sockets and lights of a 4-bedroom house for one day, according to Musk. Tesla’s ultimate goal is to create an integrated package for the home that includes solar roofs, energy storage and electric vehicles. “You can solve the whole energy equation with that,” he said. Musk also repeated a theme he has been raising a lot lately. Tesla/SolarCity isn’t out to put utilities out of business. Instead, Tesla wants to partner with utilities . The company is offering a new and larger commercial energy storage system for utilities, the Powerpack 2, which is 210 kWh/50 kW. Tesla recently announced a deal to install 80 MWh of commercial batteries for Southern California Edison. It also has signed on to provide a 52 MWh energy storage installation for Kauai Island Utility in Hawaii. The future requires both, he said, because we will triple our need for electricity if we move to an all- electric economy, one where heating and transportation rely on electricity. Musk sees this future powered one-third by local generation and two-thirds by utilities. “The future is bright for utilities and for local generation,” he said. Musk is trying to solve two problems facing a microgrid future. First, how do you create Apple-esque design and delight-in-product for distributed energy? And second, how do you incorporate and not alienate the biggest conventional market player in power – the utility – as consumers flock to the new technologies? To make this all happen, Musk wants to merge battery company Tesla with solar company SolarCity. (Musk holds key executive and ownership positions in both public companies). The move is seen by many analysts as a way to bolster SolarCity’s earnings. Musk says he wants the merger so that he can create a one-stop shop for consumers and utilities, where they can buy solar, storage and an electric car all in one place. A key shareholder vote is scheduled on the merger Nov. 17. All eyes – at least for the short-term — are on that vote. If Musk prevails, all eyes over the long-term may be on a sea of glass rooftops. 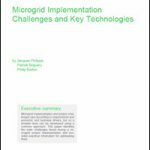 Read more stories about our unfolding microgrid future by subscribing to Microgrid Knowledge newsletter. It’s free.